Fix for wrong 'dip' scale issue that occurred in some edge cases. Canvas.RemoveClip works with targetSdkVersion = 28. Log correctly shows duplicate messages (relevant to Android 8+ devices). Updated internal libraries: FirebaseAuth v1.06, Camera2 v1.11, XUI2D v1.02, Core v8.80 and debug libs. Debugger performance optimizations and bug fixes. B4A Sdk Manager v3.29 included. The WRITE_EXTERNAL_STORAGE permission removed from the debugger. jimmyF, fireday, smercan and 6 others like this. Starter service is never destroyed until the process is killed - if you carefully read the automatic foreground notifications tutorial then you should be aware to a significant behavioral change in Android 8+. The OS kills services while the app is in the background. In previous versions the OS never killed specific services (only the complete process). This change made it much more difficult to work with the starter service as you could no longer assume that the starter service is running. Starting from B4A v8.3 the starter service will never be paused until the process is killed. Internally it switches from the service context to the application context. Several other important debugger optimizations. Bit.ArrayCopy method. Same as ByteConverter.ArrayCopy. Support for Java 8 jars and AARs. B4A Sdk Manager v3.27 - Supports Java 10. Files can be added to groups directly. For loops optimization (in release mode). BitmapCreator v3.60 is included as an internal library. xCustomListView v1.63 is included as an internal library. XUI v1.70 is included as an internal library. This is a large update to XUI library with support for text measurements and other features. Phone.ShellAsync - Asynchronous version of Phone.Shell. I'm very happy to release B4A v8.0. This update includes many important improvements and makes it simpler to target the latest versions of Android. #AdditionalJar with ReferenceOnly - Allows referencing jars that are only used as a reference during compilation. This is required for more complex libraries such as DJI library. 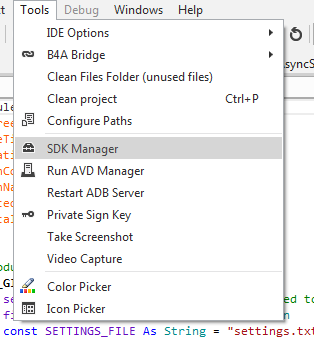 B4A Sdk Manager v3.25 - Bug fixes and support for Google based AVDs. Firebase, xCustomListView and KeyValueStore (2) are internal libraries. B4A services and activities can be shared with B4J. This update includes the new resumable subs feature. This is the most important programing language improvement since the addition of classes in B4A v2. It makes it much simpler to manage asynchronous tasks. This version sure does clean up the code without jumping from sub to sub to sub to ... to handle asynchronous processing in a very clean manner. This and the previous "multi-dex" features in my opinion are game changers for B4X. Variables and subs renaming based on the Find All References feature. Quick search supports replacing including replacing in all modules. Icon picker - Filter field supports filtering by hex code. Starter service better handles cases where the process is started by multiple intents. CSBuilder.Image adds an underscore instead of space to fix an issue with multiline strings. Application_Error - Fixed a compatibility issue with Android 2.2. PhoneCalls - READ_CALL_LOG permission added. This is a new requirement. Sender is set when raising events with CallSub or CallSubDelayed from classes. DoEvents is deprecated. A warning will appear when using it (see the async dialogs tutorial). Note that it is still supported, exactly as before. SQL library updated to make it simpler to use with Wait For. - B4A compiled libraries with service modules need to be recompiled. - Java 8 is required (Tools - Configure Paths). 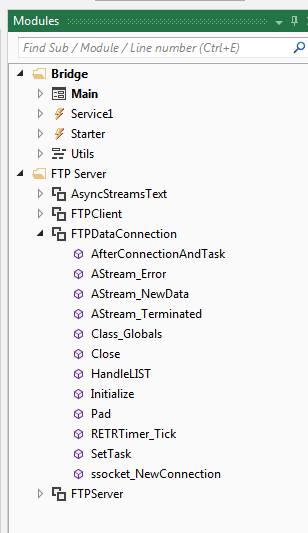 Service can extend custom classes with the #Extends attribute. This makes it simpler to create libraries that extend services. A modified version of NotificationListener library is attached as an example. Minor update with bug fixes. There are many IDE related improvements in this update. Class and module level documentation (taken from Process_Globals or Class_Globals subs). Quick search shows a list of recent searches. Designer uses the multiline text editor for text properties. 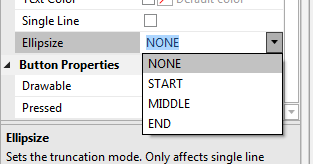 This is an important feature as in many cases it is better not to set any color and use the system default. Service_TaskRemoved event added to the Starter service. This event is raised when the user closes the app from the recent apps list. This is an Android 4+ event. 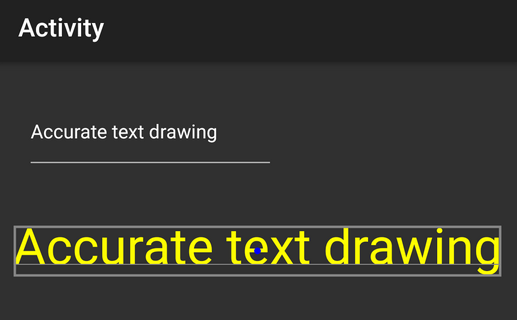 FloatLabeledEditText - Text and hint colors can be set in the designer. Regex.Replace / Replace2 - Regular expression replacement. (Java) The Tag property is set when calling CustomView.replaceBaseWithView2 (replaceBaseWithView is deprecated). _onkeydown and _onkeyup inline Java hooks. Advanced optimizations were made to the debugger which make the debugger significantly faster. This feature allows developers to provide alternative ways to handle crashes. For example, to send the crash logs by mail. 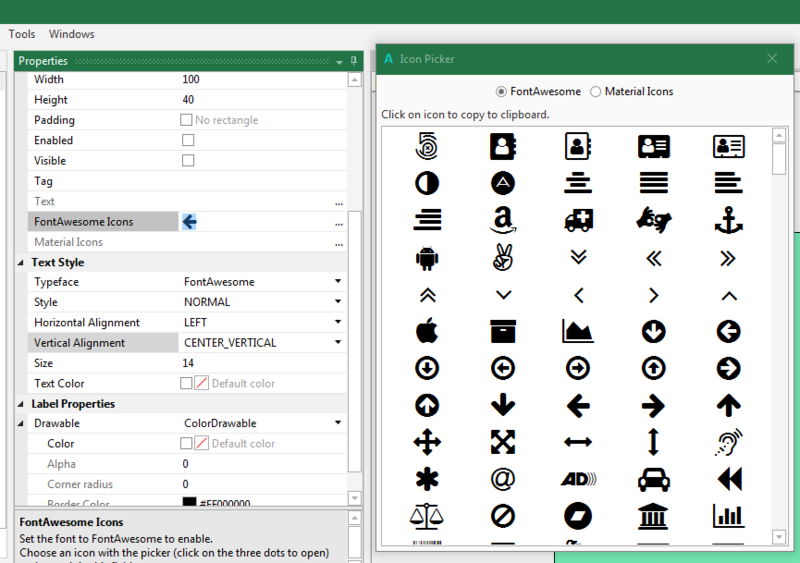 Material themes were added to the WYSIWYG designer. $AdditionalLibs$ and $AndroidSDK$ shortcuts. These shortcuts can be used in the #AdditionalRes path. They will replaced with the full path to the additional libraries folder or Android SDK folder. Buttons text is no longer upper cased when the material theme is used. The backwards / forward navigation feature was improved and there is a new list with the recent locations (Alt + N). The Logs font can be changed. #SignKeyFile / SignKeyPassword attributes. Allow using a different signing key based on the build configuration. Colors list in the designer color picker. This feature will make it simpler to integrate third party SDKs. 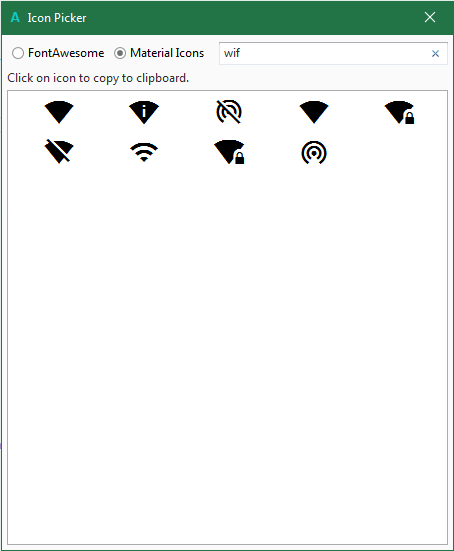 Fix for Msgbox2 icon in Android 5 devices. Cancel option in the device selection dialog. 5 new View methods: SetLayoutAnimated, SetVisibleAnimated, SetColorAnimated, SetTextColorAnimated and SetTextSizeAnimated. With these methods it is very simple to add nice animations effects to your app. Designer animations - Layouts added with the designer are (optionally) animated. Support for constants: Dim Const x As Int = 2. Constant variables are assigned when declared. Their value cannot be later changed (enforced by the compiler). Screen video capture - Requires Android 4.4+. Very useful for demonstrations. Activity_ActionBarHomeClick event - Handles the action bar icon click event. This event replaces the event from StdActionBar library which doesn't work on Android 5 devices. Better handling of the internal message queue on Android 5 devices. Visual designer supports custom fonts. Visual designer supports adding borders to views that use ColorDrawable. Borders can also be added with ColorDrawable.Initialize2. IsDevTool keyword - Useful when reusing code with B4J / B4i. Designer - Select all files option. Designer - Double click on view's name to add to the script. Clear logs when program starts option. targetSdkVersion is lower than 20 and no theme is explicitly set. B4A-Bridge was updated with several fixes and the PHONE_READ_STATE permission was removed (it was used in the past to show the device id). Support for Android L (preview version). Support for the files structure of latest Android SDK. Sender keyword - correctly manages events from multiple threads. Optimized dexer supports Java 7 classes. This is required in order to compile apps with the latest Google Play Services version. Rapid debugger - several bug fixes and improvements to error reports. Anchors feature - makes it easier to target multiple screen sizes. See this short video. Copy & paste - work both inside the layout or between different layouts. The views are organized in a tree for easier navigation. AutoScaleAll keyword now works with all variants, not just the "standard" variant. 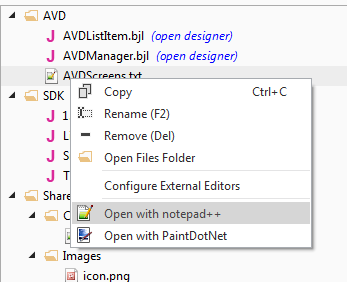 Colors fields can be copied and the colors values can be pasted or directly typed. Designer script find / replace dialog. The grid is saved in the layout file. Landscape / Portrait designer keywords to test the current orientation. UI Cloud threshold reduced to 10 seconds. Sync button in the Files tab - Syncs the project files with the Files folder. Modules added to the Find Sub / Module tool (Ctrl + E). Tabs order in the IDE is preserved. Modules files that were not modified will not be saved thus preserving the correct time stamp. DateTime.SetTimeZone now accepts a Double instead of Int. Shortcuts: F11 - Restart (rapid debugger), F2 in the designer connects to the device. JavaObject v1.00 - new RunMethodJO / GetFieldJO methods. Compiler warnings - A new warning engine that helps finding common errors as soon as possible. Returns Object instead of String. Sender is set when calling from a class. This is useful for events implementation. Significant performance improvements when calling subs in classes. This version gives access to the new UI Cloud service. WYSIWYG Designer and B4A-Bridge listen to an alternative port if the main one is already bound. Layout files saved in the new version cannot be loaded on older versions of the IDE - It is therefore recommended to backup existing projects before loading them in the new version. Great idea. Thank you for taking the time to collect this information. Good info, I couldn't find the 2.02 changes anywhere, and the announcement of it I only saw mentioned as a comment in another thread. I had grabbed the beta right before it that wasn't announced either. It is always good to know what changed, so if there are issues in code and a recent change was in that area you can debug easier too. So what magic do I need to work on my download link to actually FIND the 2.02 version ? The installer is available in the same link as v2.00. my link still says its for 2.00 exe and it downloads 2.01 so thanks again but not what I'm looking for .. There is no need to edit the link. Your link will download v2.02. If it was needed I would have wrote it. Note that this is the wrong place to post about not receiving a link. Future posts will be deleted. Thank you for the changelog. In fact I can store different types of data in different elements of the array, so I guess the warning is wrong. The only way to find relevant threads in the forum is with the search engine. All three queries return this thread as the first result. How to access this object and its properties?